Universal City, California, June 9th, 2014 - A Marine unit stationed in the hostile province of Helmand Afghanistan wilderness faces a harrowing mission as they try to help a fugitive woman reach safety from the Taliban in Jarhead 2: Field of Fire. 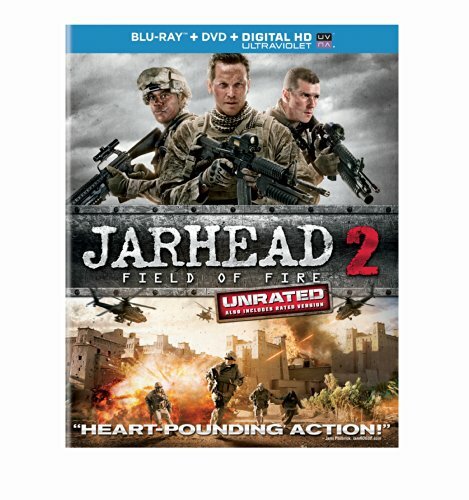 Packed with intense action, thrills and the gritty reality of war, the all-new movie Jarhead 2: Field of Fire will be available on Blu-ray(TM) Combo Pack including Blu-ray(TM), DVD & DIGITAL HD on August 19, 2014, including both an R-rated and Unrated version as part of the DVD Originals(TM) line from Universal 1440 Entertainment, a production entity of Universal Studios Home Entertainment. The film will also be available on DIGITAL HD two weeks early on August 5, 2014. Jarhead 2: Field of Fire is inspired by Jarhead, the highly praised feature film that follows a naive young recruit and his platoon mates from the intensity of boot camp to being deployed to a lonely outpost in a surreal desert setting. Jarhead 2: Field of Fire transports the action to the brutal battlefields and dusty villages of Afghanistan, where a band of Marines risk their lives to save a woman fleeing certain death at the hands of her Taliban pursuers. Battle-scarred and disillusioned by the war, Corporal Chris Merriman (Josh Kelly, Transformers franchise, "Army Wives") is put in charge of a unit whose next mission is to resupply a remote outpost on the edge of Taliban-controlled territory. While driving through the hostile Helmand province, a Navy SEAL (Cole Hauser, Olympus Has Fallen) flags down their convoy and enlists the unit on an operation of international importance: they must help an Afghan woman famous for her defiance of the Taliban escape the country. Without tanks or air support, Merriman and his team will need all the courage and firepower they can muster to fight their way across the war-torn country and shepherd the woman to safety. Jarhead 2: Field of Fire is a thrilling action-adventure that celebrates the courage and patriotism of the men and women in the U.S. Marines. Jarhead 2 stars Josh Kelly who served three tours in Afghanistan and one in Iraq as an Army Ranger before starting his acting career. The film also features Stephen Lang (Avatar, Gettysburg), Esai Morales ("Criminal Minds," La Bamba) and Bookeem Woodbine (Riddick, Total Recall). * Blu-ray(TM) unleashes the power of your HDTV and is the best way to watch movies at home, featuring 6X the picture resolution of DVD, exclusive extras and theater-quality surround sound. * DVD offers the flexibility and convenience of playing movies in more places, both at home and away. * DIGITAL HD with Ultraviolet lets fans watch movies anywhere on their favorite devices. Users can instantly stream or download movies to watch on iPad(R), iPhone(R), Android(TM), smart TVs, connected Blu-ray(TM) players, game consoles, and more. The Universal 1440 Entertainment banner develops and produces live-action and animated productions directly for the home entertainment, television and the stage. Since its formation in 2005, the group has assembled an exceptional roster of animated family fare, including the brand-new animated feature-length home entertainment release The Little Engine That Could; the Daytime Emmy(R)-winning "Curious George" television series on PBS KIDS; and a string of hit Barbie movies, based on the world-renowned Mattel-branded doll. The group also has successfully built upon some of Universal's highly celebrated live-action franchises, most recently launching the Tony Award(R)-nominated hit touring stage production Bring It On: The Musical; the adrenaline-fueled actioner Death Race 3: Inferno; and the latest in the terrifying suspense saga Curse of Chucky. Projects currently readying for release include the all-new home entertainment features Scorpion King 4: Quest for Power, Dragonheart 3: The Sorcerer's Curse and Jarhead 2: Field of Fire. Universal 1440 Entertainment is a production entity of Universal Studios Home Entertainment (USHE). USHE is a unit of Universal Pictures, a division of Universal Studios (www.universalstudios.com). Universal Studios is a part of NBCUniversal, one of the world's leading media and entertainment companies in the development, production, and marketing of entertainment, news, and information to a global audience. NBCUniversal owns and operates a valuable portfolio of news and entertainment television networks, a premier motion picture company, significant television production operations, a leading television stations group, world-renowned theme parks, and a suite of leading Internet-based businesses. NBCUniversal is a subsidiary of Comcast Corporation.